“Using a multi is a good insurance policy,” says Ronald Hoffman, MD, a wellness-oriented integrative physician in private practice in New York. Fortunately, this type of policy, unlike those sold by health insurance companies, is easier than ever to obtain. No longer confined to pills, today’s multis also come in liquids and powders, and ingredients have evolved beyond specific vitamins and minerals. Many multivitamin products contain concentrated whole foods, antioxidant fruit blends, superfoods such as spirulina, and probiotics and/or digestive enzymes to mimic nature and enhance absorption of nutrients. 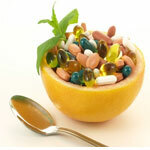 Some supplements are made with raw food ingredients; other options include vegetarian, kosher, organic, or gluten free. There are even effervescent powders. Which one should you choose? That depends upon your diet and goals. “If you’re striving for optimum health, you’ll be better served by higher-quality products with a more comprehensive range of nutrients in quantities shown to enhance overall well-being,” says Alicia Stanton, MD, who specializes in preventive health and hormone balance in Glastonbury, Conn.
Vitamin A: up to 5,000 IU, with up to 15,000 IU of mixed carotenoids. Carotenoids are antioxidants that give yellow and orange plants their vibrant color, and our bodies use them to make vitamin A. Too much vitamin A can be toxic, but carotenoids don’t carry the same liability. On the other hand, some people have difficulty converting carotenoids to vitamin A, so a combination of both offers the best of both worlds. Sometimes, carotenoids are listed separately on a supplement label, further down on the list. B Vitamins: While amounts of individual B’s may vary, aim for approximately 50 mg each of vitamins B1 (thiamine), B2 (riboflavin), B3 (niacin or niacinamide), B5 (pantothenic acid), and B6 (pyridoxine); look for 500 mcg of B12. Because they can increase energy levels, B’s are best taken early in the day. Vitamin E: 400 IUwith mixed tocopherols. Tocopherols are a family of nutrients, including vitamin E. Getting a combination increases benefits. If you compare the nutritional content of food-based products with more traditional multi pills, you might see smaller amounts of key vitamins, such as B’s and C, in some food-based versions. Foods contain a very broad range of nutrients, and because these types of formulations aim to mirror nature, they provide a wide variety of bioavailable ingredients to support well-being. The important thing is to find what works best for you.